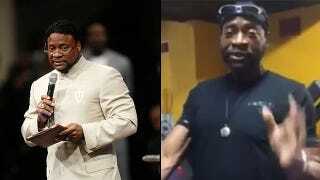 Bishop Eddie Long has a gaunt new look, and many people in his congregation have been questioning his health because of his recent weight loss. But let Long tell it, in August he put down the Popeyes chicken and biscuits and picked up a plant-based diet. But there seems to be more to his story than he's letting on. According to the Christian Post, Long has been hospitalized in Atlanta because he has stage 4 cancer. I am recovering from a health challenge that I trust God to deliver me from. It is unrelated to the eating-for-life diet, consisting of mostly raw vegetables, that I am continuing as part of a holistic approach to good health. At this time, my family and I are requesting that you respect our privacy. I truly appreciate your prayers and support for me, my loved ones and my beloved New Birth church family.